HANNIBAL – A celebration of health and wellness was held recently at Fairley Elementary School during its sixth annual Healthy Family Night. 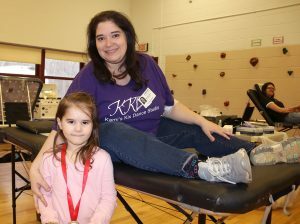 After donating blood during Fairley’s recent blood drive, Nicole Earle proudly poses for a photo with her daughter, Taylor. 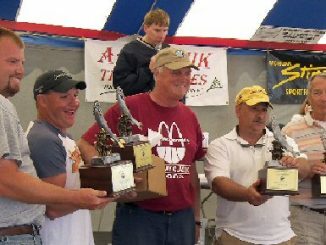 The event was held in conjunction with a blood drive and also featured a variety of physical activities, informational booths, local agencies and prize giveaways. Families explored dozens of vendor tables, participated in various exercises, practiced karate and enjoyed healthy snacks. 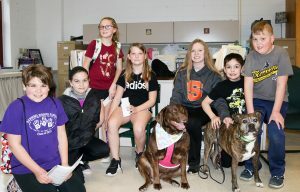 Hannibal Central School District students are all smiles as they join the Reading for Rescue dogs during Healthy Family Night. According to school psychologist Brittany Meier, this year’s Healthy Family Night was a resounding success. She noted that the event was a team effort and expressed her gratitude to physical education teacher Lynn Halliwell, school social worker Maggie Olon and everyone who helped organize, plan and contribute.